Agility is the ability to respond adaptively: not with one approach, but with many, facilitated by our ability to question, understand and act. It’s about solving a problem today and doing it differently tomorrow, but being effective at every step. It’s the challenge for organisations in the Social Age, a time defined by constant change and the erosion of historic models of power and authority, communication and control. We gain agility through mindset, technology, learning and leadership and it’s these four aspects that i want to deconstruct today. To be agile, an organisation needs the right Mindset: this is to recognise that the world has changed, and to approach things accordingly. Under the old social contract between organisation and individual, the organisation provided structure, security and opportunity whilst the individual gave their time, loyalty and effort. None of this is assured anymore: the social contract is broken when people are deployed as ‘resource‘ and dismissed at will. There is no long term contract in place anymore, even where there is good intention. People gain their support and long term development from their community, which sits outside the organisation. So to be agile, to be able to inspire and engage individuals to help, organisations need a fair social contract in place: this would include rewarding people with social recognition and reputation, such as giving them great LinkedIn profiles, or externally recognised qualifications. From the organisational point of view, the mindset has to be ‘how do we solve our problem‘, but also, ‘how do we help this person achieve more, both in this job and their next‘. The agile organisation must be socially responsible: because their ability to be agile depends on the engagement of both employees, associates and the wider community. Not to mention because it’s a great thing to be. Social responsibility is about doing what’s right, what’s fair, not just what’s bound by law, regulation, process or system. The ‘Framework for Fairness‘ i explored last year looks into this, looking at how we can incorporate fairness into every aspect of organisational work. Fairness leads us into equality: the ways that we provide equal opportunity, not only because it’s right, but also because it’s central to being socially responsible and, when it comes to it, because it makes good business sense. Diverse teams are the only teams that can truly provide both permission and space to contribute and build effectiveness. 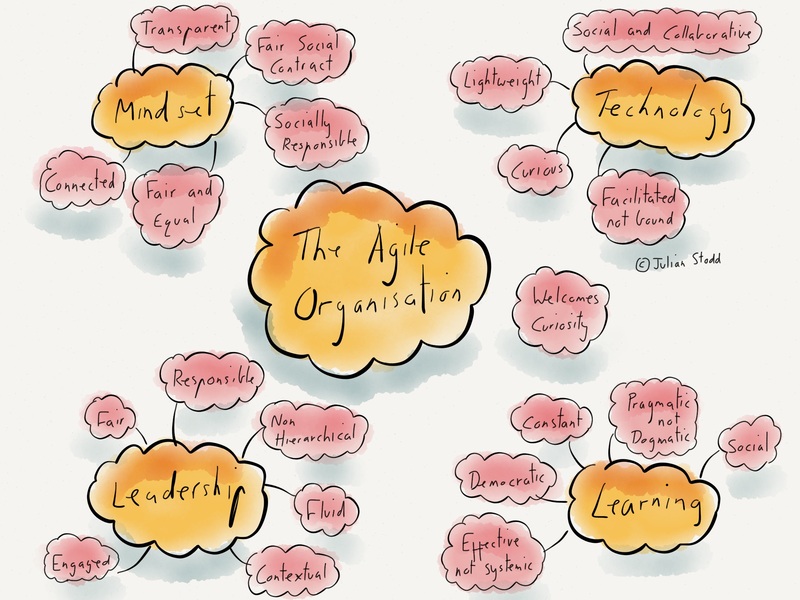 And finally, the agile organisation needs a mindset of connectedness: both internally and externally. We need fluidity of communication: not just one collaborative technology or platform but many. The ability and permission to experiment and change. Don’t just buy one tool, invest in a fluid mindset and don’t be constrained by the IT department: do the opposite. Give them permission and budget to be facilitators, not guardians of uniformity. The second aspect to consider is Technology itself: social and collaborative, but surrounded by permission. The tools themselves won’t give us the conversations and engagement we need. That will only come through mindset. The agile organisation will take a lightweight approach to technology: instead of buying heavyweight systems to facilitate collaboration and communication it will be more fluid. Recognising the evolutionary nature of the technical ecosystem: the ways Apps explore new aspects of communication and collaboration at speed and giving people permission to try things out and then share their learning. When i talk about the IT team becoming facilitators, i mean they can become the wise tribe in this area: helping people to share their stories, helping them to experiment and explore. It’s about being facilitated by technology, not bound by it. Uninhibited curiosity is a key trait of the Social Age: through our mindset and our technology, we must be facilitating this. Learning? Learning is changing, away from something formal, bound by time and space, towards something more fluid, constant, responsive and adaptive. 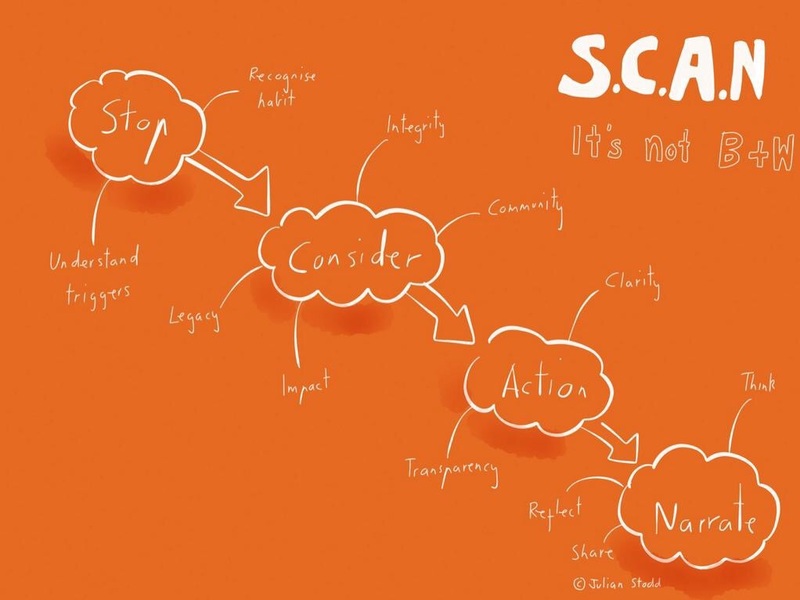 It’s more about co-created meaning, not organisational stories that we hammer into people. Learning should be pragmatic, not dogmatic: more about helping people being effective than an end in itself. What i normally say is that the organisation frames the story, but the words and meaning are co-created by the cohorts and communities, so each group creates a different flavour, but always around the same core narrative. The organisation can shape and own the narrative, but the stories will differ each time around and rightly so. We want people to find understanding within it, not be told what they have to understand. With the right learning methodology informing our instructional design, and the right approach to Scaffolded Social Learning, we provide the resources, permissions and spaces for this to happen, fulfilling both the organisational need for consistency and scalability alongside the individuals need for relevance, timeliness and applicability. In the agile organisation, learning is about being effective, not just about systematic sheep dips. It’s democratised and open, not restricted by current role or hierarchical position. 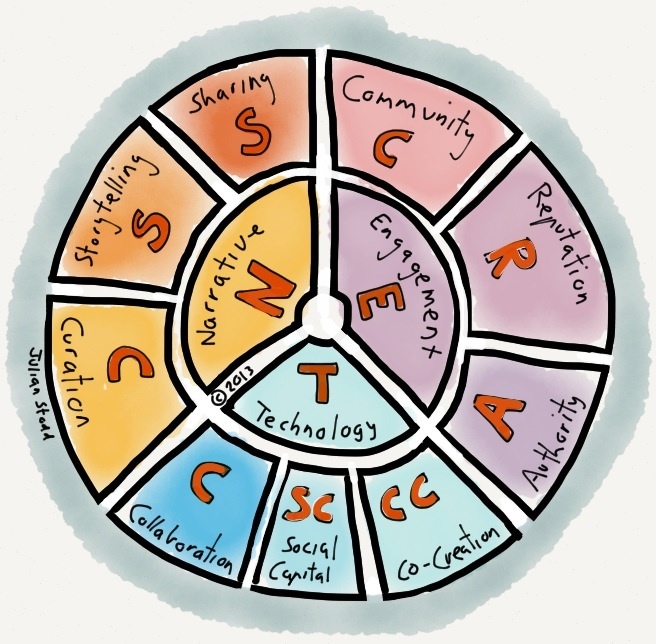 Free access to resources and communities to facilitate the agile learner. In a performance support mindset, it’s also more constant: learning on demand (which doesn’t have to mean ‘short‘, but does have to mean both pragmatic and effective). It’s about tools and technologies that connect us to our communities, that let us be more effective and help us to get stuff done. Supporting agility. Making both us and the organisation itself agile. Within this space, Leadership is vital, but not just formal and hierarchical leadership: it’s about Social Leadership, with it’s authority that is granted by the community. Social Leadership is consensual and contextual, it’s based upon reputation that is earned through consistent behaviour and response within community. Build it right, over time, and your authority has a solid foundation, outside of position or role. Agile organisations support their formal leaders and wider teams in developing social authority because, at one level, everyone needs social authority. A key aspect of Social Leadership is that it’s fluid: it’s picked up and put down as the situation warrants. Bear in mind that humility and a willingness to set it aside are mantles of Social Leadership. Again, we need to understand what it means to be fair: one aspect of Social Leadership is to perpetuate fairness through every conversation, not just the big ones. These four aspects of the agile organisation work in tandem: each feeding off the other. You can’t have agility without Social Leadership, and you can’t have Social Leadership without facilitating and fluid collaborative technology. You can’t have the technology without the mindset and, if you have the mindset for agility, you need an approach to learning that delivers it. It’s a fundamental challenge for any organisation in the Social Age: in a time of constant change, are they ready to grasp the bull by the horns? This isn’t a change project: it’s a changed mindset with everything falling into place behind it. Agility won’t be delivered through rules, systems and control. It will be delivered through mindset, permission and support. 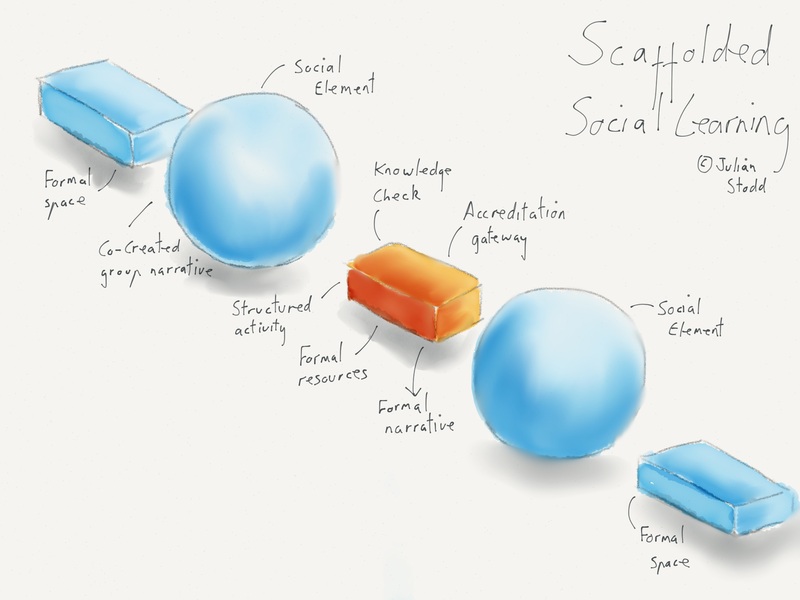 This entry was posted in Agile and tagged Agile, Agility, Leadership, Learning, Mindset, Organisational Design, Permission, Scaffolded Social Learning, Social Age, Social Leadership, Social Learning, Technology. Bookmark the permalink. Has made me highly reflective in respect to the organisation I am employed by. Great article, extremely well written, presented and great use of visuals.